27 May: FOI in Mule Days! 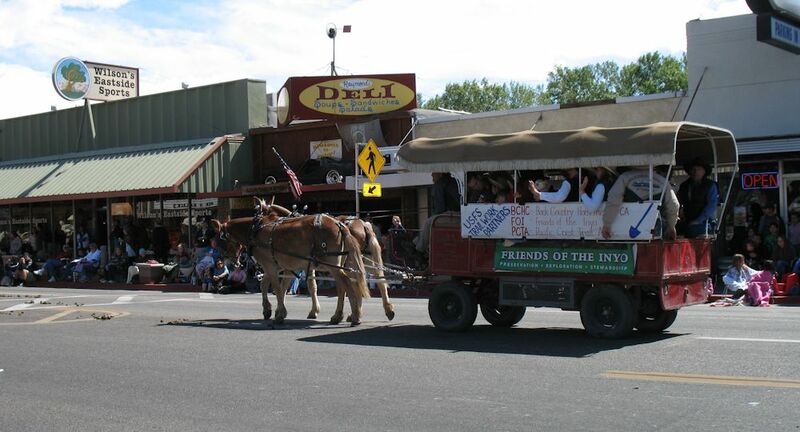 We were honored to receive an invitation to participate in the Mule Days Parade from our partners the Backcountry Horsemen of California and the Pacific Crest Trail Association. FOIers Todd Vogel, David Herbst and Drew Foster joined a robust crew of BCHC and PCTA folks on the wagon piloted by Alton Chinn, of Bishop. It was great fun and great to be recognized for our efforts. The thanks really go to all our volunteers who helped on backcountry trails this past year! Click the attachment to view and download the Inyo National Forest’s Travel Management Record of Decision. 03 Feb: 2009 Chocolate Peak Winter Expedition Successful! Braving sunny wind-swept skies, temps hovering in the 50’s, and the possibility of missing the Superbowl, we managed once again to summit Chocolate Peak, in the Piper Mountains, on the FOI 2009 Chocolate Peak in Winter Expedition. Conditions made for easy walking – and challenging snowshoeing… Thanks whoever brought the chocolate torte!